Just as the boundaries of a guitar string (how it is pinned at both ends) determine how it vibrates, the distant past and far future of the universe may govern what happens today. … imposing old Newtonian Schema thinking on new quantum-scale phenomena has landed us in situations with no good explanations whatsoever. If these phenomena seem inexplicable, we may just be thinking about them in the wrong way. Much better explanations become available if we are willing to take the future into account as well as the past. But Newtonian-style thinking is inherently incapable of such time-neutral explanations. Computer programs run in only one direction, and trying to combine two programs running in opposite directions leads to the paradoxical morass of poorly plotted time-travel movies. In order to treat the future as seriously as we treat the past, we clearly need an alternative to the Newtonian Schema. And we have one. Most physicists are well aware of a different framework, an alternative where space and time are analyzed in an even-handed manner. This so-called Lagrangian Schema also has old roots and has become an essential tool in every field of fundamental physics. But even physicists who regularly use this approach have resisted the last obvious step: thinking of the Lagrangian Schema not just as a mathematical trick, but as a way to explain the world. Perhaps we haven’t been taking our own theories seriously enough. As we disentangle entanglement, we might spare a thought for Bede (or as he is more frequently remembered, Venerable Bede); he died on this date in 735. 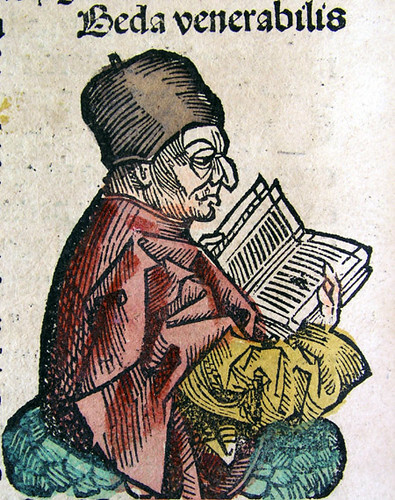 An English monk, Bede studied and wrote widely on scientific, historical, and theological topics, ranging from music and metrics to exegetical Scripture commentaries. He was an accomplished translator (Pliny the Elder, Virgil, Lucretius, Ovid, Horace, and other classical writers in both Greek and Hebrew). And his Historia ecclesiastica gentis Anglorum (The Ecclesiastical History of the English People) has earned him the title “The Father of English History.” Indeed, it was in this work that Bede established as common practice the use of “BC” and “AD” with dates.